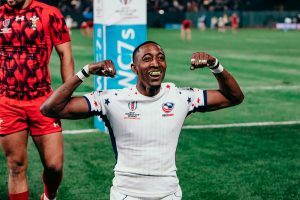 Last October, the HSBC Sevens team embarked on the journey of telling the behind the scenes story of the incredible USA Men’s Sevens team. Almost exactly a year later, the final chapter is complete and live for the world to see. Part two of ‘The Pioneers,’ is the finale of the two-part documentary following the team’s attempt to shock the world and take home the Rugby World Cup Sevens on home soil, which energised the US sporting community at an incredible tournament in San Francisco. H+K has been there through all the ups and the downs over the past 12 months, following the team throughout the HSBC World Rugby Sevens Series, alongside them in training camp and then at the pivotal moment in July when their home soil opportunity came to a head. After the success of part one, published around the Rugby World Cup Sevens, expectation was high, but with a multi-channel publishing approach, designed to engage fans who may not know anything about Rugby Sevens, The Pioneers Part Two was distributed across several platforms including NBC Sports Network and viewed by new and existing fans all over the world. Combined, The Pioneers documentary series has received over two million views, generated over 75 earned media articles and recently been shortlisted for industry awards.